What do I think about them? Well they’ve been a lot of work and they’re a bit on the small side for me, although wearable. The pattern, interestingly, doesn’t give any measurements, just average women’s size, and no tension either. Knitting from a pattern, or what Elizabeth Zimmerman called ‘blind following’ I find very hard but it’s what I planned to do when I set out on this project. When I start designing these from scratch I will make adjustments – the most obvious one being the size of the thumb which is the same number of stitches as the fingers – seems odd to me. The pattern is written out in full, with no charts. This meant that I spent a while making my own chart just to get my head round what was going on. The shift to written out instructions for knitting is linked I think to the commodisation of knitting in the 19th century and the need of the commercial spinners to make / force / encourage knitters to buy the recommended yarn for the pattern. Yarn: The Forsells 3 ply is uneven and can be stringy. On the other hand it is pure wool and it is both British and spun in the UK, which might be important if I were after some sort of accuracy in comparison with gloves as they were knitted 40 – 50 years ago. Tools: I used circulars up to the fingers, I think they are Prym, plastic and metal ones. 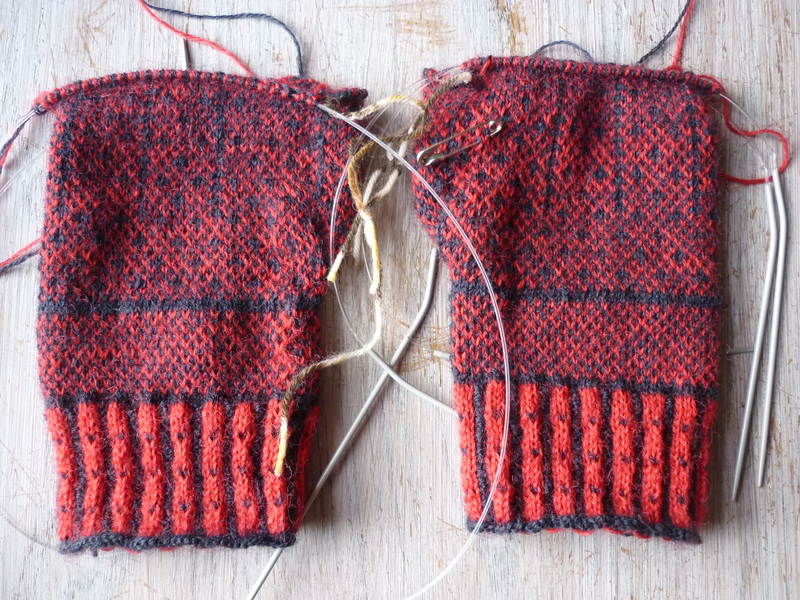 They are ok until the knitting gets too tight or my hands get sweaty – not good for this kind of thing! I’m finding it hard to source Addi turbos and I know I don’t like Knitpros – too pointy. For the fingers and thumbs I used double pointed needles (dpns), again Knitpro to start with but they are highly polished stainless steel and throw too much reflection when knitting under a work lamp (Luxo) which I have to do for this after dark. I reverted to old Aeros, size 14, dull aluminium, made in Redditch, the needle capital of the UK at one time, even though they were a bit longer than I would have wished. There’s a moral here? What do I like about the Midge and Flea gloves? I love the single line of black stitches up the inside of the hand. It makes the change over of the rounds very neat. 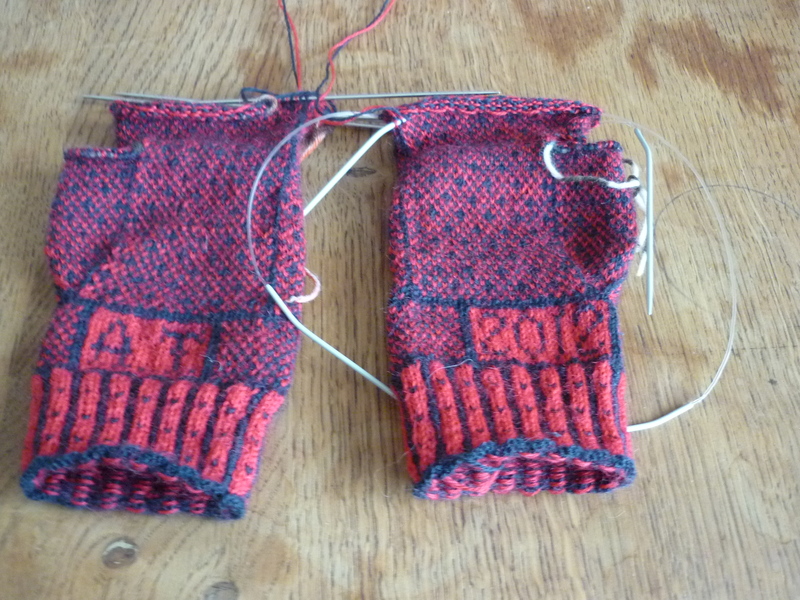 I really like the way I did the thumb gusset which I think has come out very well, see below. And I really like the lines up the back of the hand which actually imitate the lines of stitching on the back of leather gloves, see below. 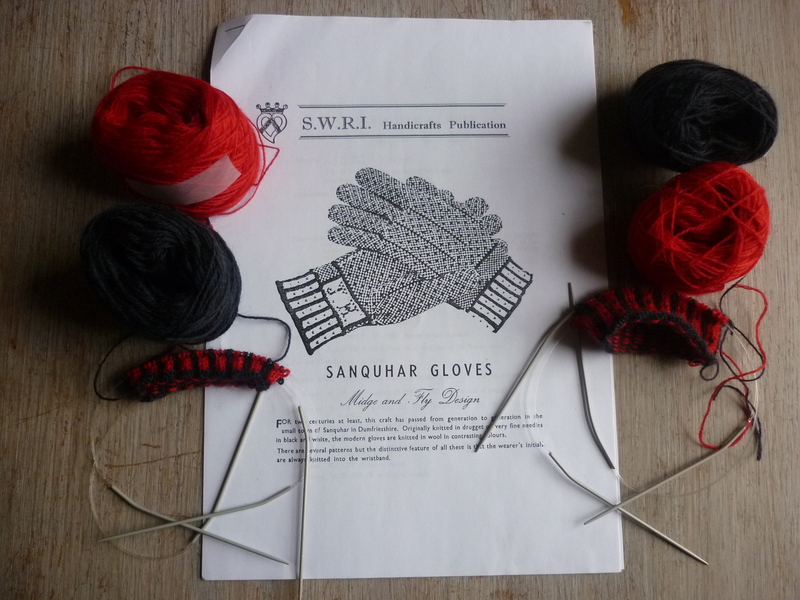 Well the Midge and Flea gloves which I had aimed to have finished by the end of February, in my plan to knit all the Sanquhar patterns, are not complete. It is 10 pm on 29th February and I still have some fingers and both thumbs to do … at least a morning’s work, if not more. Why have self imposed deadlines? Because if I don’t, I won’t get anything done. I know that until I’ve got impossible amounts on the go, I can faff around indefinitely. So I will try to complete these tomorrow or at least maybe make a start on the next pair. These are up to the fingers now. I’m not sure the wool is as good as it should be, or my knitting for that matter, both look a bit uneven. I had a spell when my hands were really sweaty – there’s no other word for it – and that has caused a whole section to be tighter I think. Also I was working from the inside of the knitting but then it got turned round again… also the stainless steel needles – Knitpros, I think, are very shiny and have to be held very tight… so all in all not as good as I would have wished. I’m now up to the top of the thumb division on both gloves, in fact I’m ready to do the fingers on the left one. I like to photograph them together though. Why knit them both at once? Mainly so that I can do the same thing on both – if I do them concurrently I can remember what I’ve done and do it again, whereas if I do the second one later I usually can’t remember what improvements or modifications I’ve made. 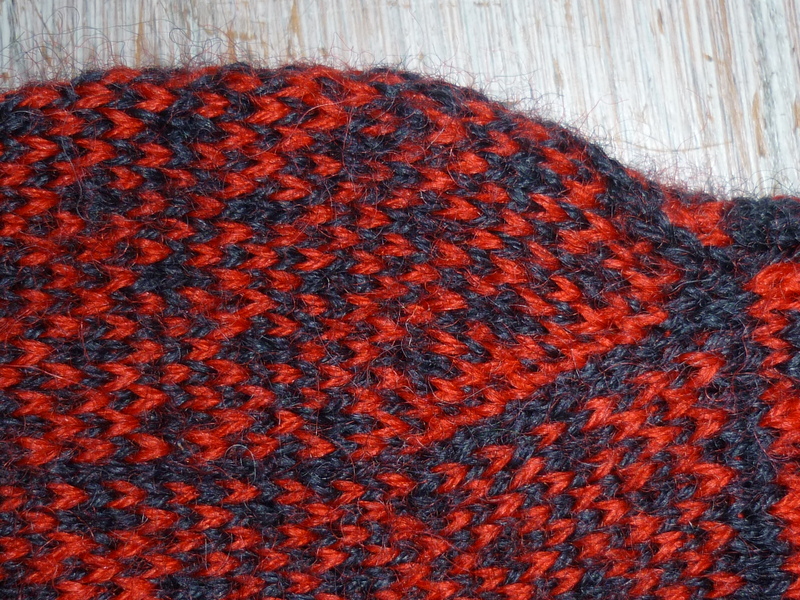 It also avoids the second glove/mitten/sock syndrome in which people don’t make the second one. 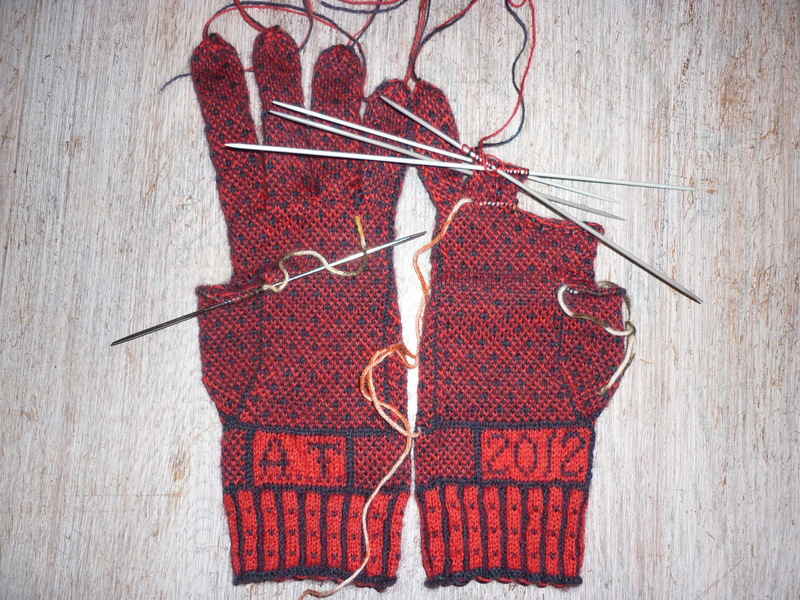 I’ve now got as far as the top of the thumb increasing on both gloves. 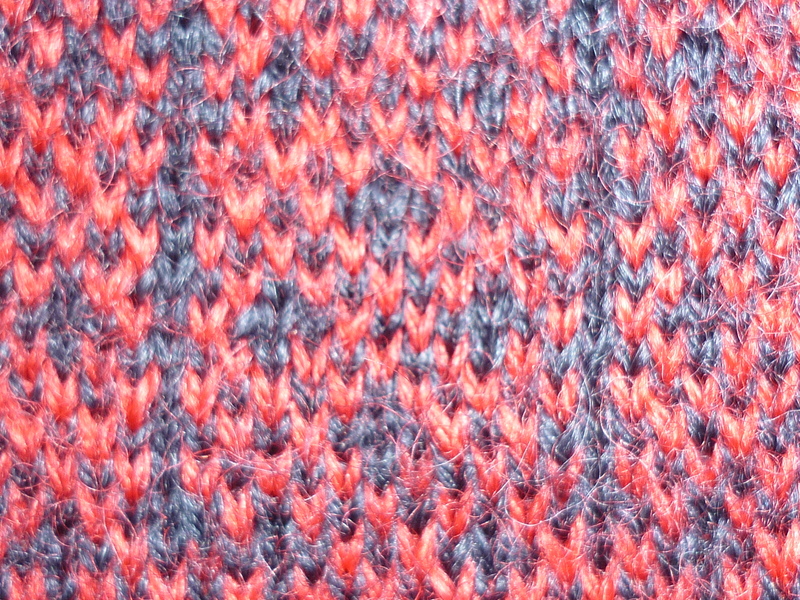 I’ve added a black stitch down the side of the increasing which was not in the pattern. The pattern is written out row by row so I have charted parts of it so that I can understand what is going on better. Why are patterns not charted? This seems to be linked to the rise in commercial knitting and written patterns in the 19th Century. Before that, presumably there was an oral tradition of passing on how to do things as many ordinary people would have been unable to read or write…. Not sure about this. Anyway, this type of knitting is much easier with a chart and so I have made some for relevant parts. 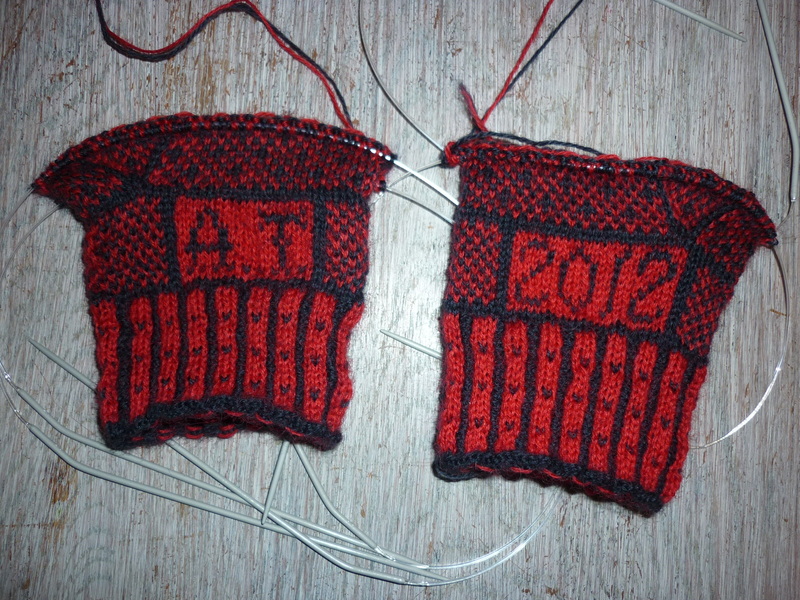 I’ve finished the wristband on both gloves – my initials on the left and the date on the right, see above. This feels like a big hurdle out of the way as these have to be placed carefully and charted with each line being followed from the chart. The chart was done on large format graph paper, probably about 5mm squares which means that it can be read easily. The chart for the last pair I knitted, the Mary Allen ones, was on 2mm squares, or probably 1/10 inch and had to have a ruler under each row to be able to follow it. I’m knitting on circular needles, which I only changed to a few months ago, having had a lifetime of knitting on double pointed needles (dpns) for socks, gloves and mittens although I had experimented briefly with knitting small circular things with two circulars having heard about it from the Cat Bhordi book ‘Socks soar on circular needles‘. I was prompted to try again after I met and talked knitting with another expert knitter who also put me onto further technique, knitting with the work inside out, meaning that the floats go round the outside of the work. This means less chance of them pulling tight and puckering the work. Sometimes I do this and sometimes the work just turns so the rights side is outside anyway. The search for good knitting is interesting as it means ‘neat’, ‘even’, ‘tidy’, attributes that women are supposed to aspire to. I’m not sure about this and veer between wanting things to look ‘home made’ and not machine made, and wanting them to look ‘professional’, that is neat, etc. I was showing my Mary Allen gloves off at the knitting group I drop in to, the Yarn group in Huddersfield, and someone said ‘So neat, they could be machine knitted’ which I took as a backhanded compliment. Of course, even as knitting machinery progresses, circular two colour stranded knitting is still not technically possible, of at least not commercially. I think I am right in saying this? I’m up to the cuffs on both the midge and flea gloves, in fact on the first, the left hand one, I’ve done the initials panel too. This knitting is concentrated work. I need to be in good light, with a flat surface near for the pattern and chart, undisturbed, as getting up and down with two balls of wool and a couple of circular needles is just too much of a hassle… so this is not knitting as therapy or relaxation, or not for me, or not at the moment. Much has been written in the recent wave of knitting activity about knitting as therapy, about being ‘in the zone’ and so on. Books such as Zen and the Art of Knitting, explore knitting as meditation, as the sub title suggests, Exploring the Links between Knitting, Spirituality, and Creativity. I don’t agree with this. Knitting has been an activity that was a chore just as much as tending crops or cleaning the house for many women only 30 or 40 years ago. You knitted because you could not afford to buy. Now, because of twists in global economics that seem like a bizarre fairy tale, it is cheaper to buy many goods, knitwear included. Knitting these gloves is hard work. I’m having to be careful of my hands so as not to get twinges, aches and pains. I’m conscious that I might not be able to do this indefinitely – I have friends who can no longer knit or play a musical instrument because it makes their hands too painful. It’s hard on the eyes too and I need my strongest specs. Backs and shoulders have to be watched, as in most hand work. The challenge of making my fingers and hands do what I want them to do with the yarn and needles is a surprise. I can’t listen to any radio that requires me to follow the story. 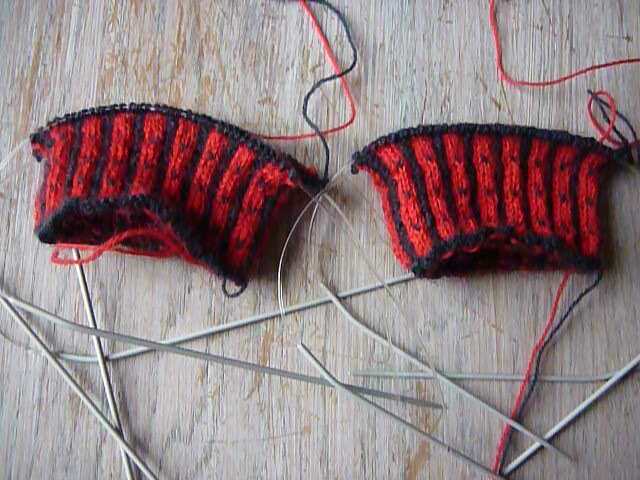 I downloaded ‘A Tale of Two Cities’ , appropriate I thought in the current Dickens fest, thinking I would listen to that, but it’s just not possible to do this knitting and listen to something as rich and complicated. So why do it? The reasons are the usual ones in answer to that sort of question: the challenge, the satisfaction, the learning of new skills, the discovery of new or forgotten facts, the research and collection of information and so on … and perhaps because of the pleasure it gives me? This is the earliest pattern published by the Scottish Rural Womens’ Institute, dated 1966 so I decided to make this the first in my series of red and black ones. 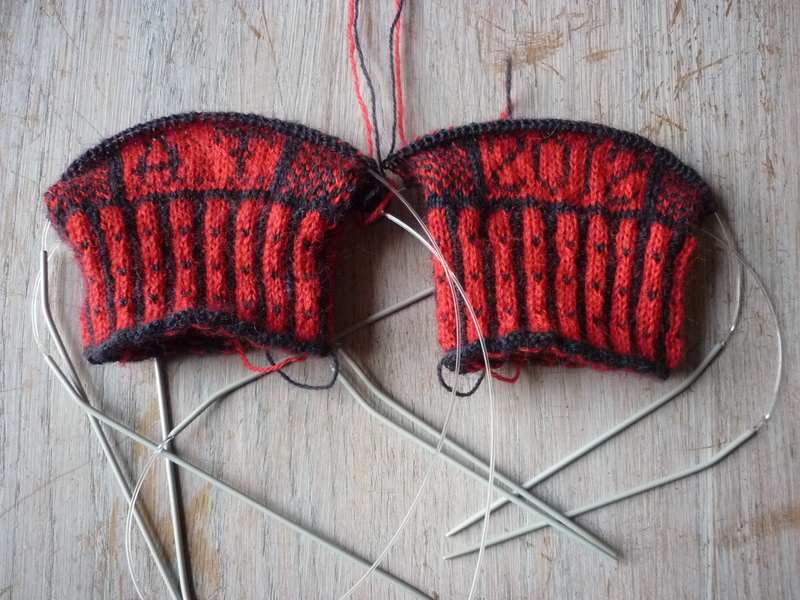 Looking at the image on the pattern, above, makes me wonder if these gloves are just an adaptation of a rural glove that might have been knitted anywhere in the north of England, Wales or Scotland. The initials band and the stong contrast in the two colour rib look slightly out of place with the speckled pattern of the midge and flea.